One of the great things about Spain is eating. On our trip, my husband and I went out of our way to find the non-touristy eateries since non-touristy areas equal two things: better food and better prices. We weren't let down with Sol Soler, located in the Carrer del Planeta in the Gràcia district. Gràcia used to be a separate city in itself before Barcelona became as sprawling as it is today. It's definitely where you'll find the locals as well as plenty of little tapas bars and also a large collection of Turkish food. Guadi's Parc Güell is also located in the Gràcia district. More on that later. Barcelona is a little tricky, since the language is Catalan and not Spanish. So they say "Hola," but also "Merci." With that weird combination, we have to say, we felt right at home after dealing with Swiss German. But we found a lot of people spoke English, even the guy running Sol Soler. But either way, you can usually go up to the counter and just point at what you want. 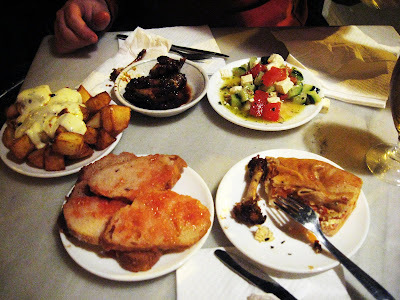 At Sol Soler, I recommend the chicken wings, tomato/olive oil bread (a Barcelona speciality), the tomato tortilla, the Greek salad, and the fried potatoes. Add a couple of beers and you've got a complete meal for two. For under 20 Euros, no less. It was hard to come back to Switzerland. It was. Actually, the picture doesn't do it justice.